JCB has unveiled trial plans for a multipurpose palm authentication system in collaboration with Universal Robot (UR) and the National Institute of Advanced Industrial Science and Technology (AIST). Starting in February at JCB’s headquarters in Tokyo, the trial will use UR’s visible light palm authentication system, which uses both palm print and vein patterns. This system, according to UR and JCB, has the “world’s highest level of accuracy” at one in 100 billion false acceptance rates. The focus will be testing the technical aspects of registration and payment authentication: capturing customer palm print and vein patterns with a smartphone camera, storing on a server, performing authentication, and returning the results to the smartphone. JCB says it will be studying how to utilise the technology for a variety of services, allowing for customers only to register their palm information in the authentication server once using their smartphone. Unlike other biometric technology, which uses near-infrared light, UR’s technology captures vein patterns using visible light, meaning that authentication can be done with a smartphone camera. 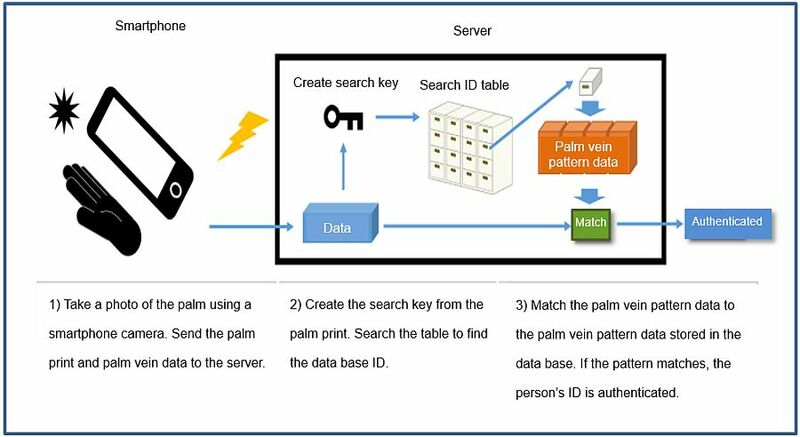 The visible light palm authentication combines palm vein pattern authentication with palm print search of a database to find the person’s information. The technology is supposedly highly accurate, with only a 0.0003% possibility of misidentification. UR says it is patenting the technology in Japan and the US as well as other countries. If all successful, it could pave the way for a replacement for fingerprint authentication, the company says.